Steven MacDonald with the latest in our series for budding writers (see www.bps.org.uk/newvoices for more information). A question that I have been asked as frequently in my life as ‘So, can you read my mind then?’ is ‘So, you must be one of the Baco family?’ Baco is my family nickname, first given to my late grandfather in World War II (nobody is sure why!). In the 10 years since flying the nest, my family heritage has been questioned in numerous places including a pub in Glasgow, a national NHS conference and the departure lounge at Charles-de-Gaulle airport. This is a common experience if, like me and a million other Scots, you were born and raised in a rural community. Within the literature on rural practice there is no agreed definition of what constitutes a ‘rural’ area. However, in 2014 the Scottish Government suggested a ‘rural’ area in Scotland will have fewer than 3000 residents and be defined as either ‘accessible rural’ or ‘remote rural’ dependent on whether the drive to a settlement of more than 10,000 residents is under or over 30 minutes in length (see tinyurl.com/qhw2jva). 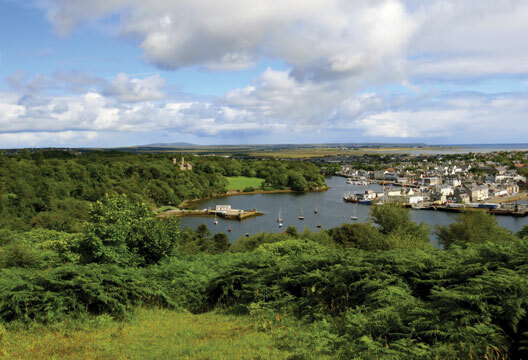 So, with a population of 9000 residents my home town of Stornoway on the Isle of Lewis is not classified as rural itself, but every other settlement in the Western Isles would be. With a total population of approximately 26,000 people, it might be surprising to learn that NHS Western Isles has no local Clinical Psychology Service. Although research on rural practice to date has focused upon international rural communities, the research tells us that people living in rural communities tend to have common distinct traits, values and needs (Harowski et al., 2006). These include having strong family ties, avoidance of conflict and discussion of feelings, having limited tolerance for diversity, a high religious involvement, possession of fatalistic and stoic attitudes, and living in a ‘goldfish bowl’ where everyone knows each other’s business (Harowski et al., 2006; Helbok, 2003; Werth et al., 2010). Add to that an obsession with whether the ferry has sailed or not, and you have Stornoway. People living in rural communities are also less likely to access mental health services because of stigma, lack of resource and lack of education of mental health issues (Cook et al., 1998; Helbok, 2003; Nicholson, 2008; Stockman, 1990). However, this does not equate to mental health services being any less necessary. Research has shown that rural residents, both adults and children, experience the whole spectrum of mental health problems found within urban populations, at similar or increased rates (Levin, 2014; Nicholson, 2008). To date the focus of research on rural practice has been upon four key ethical considerations, to which we now turn. Growing up in rural communities affords you the opportunity to occupy a number of differing roles and identities – whether that is being a cousin, gym partner, or that guy who keeps singing ‘Come On Eileen’ in the local after one too many drinks. But what if that guy is you? Some argue that all multiple relationships are unethical (Borys & Pope, 1989), others accept that they are inevitable in rural communities (Gottlieb, 1993). Instead, the primary concern is whether the relationship impairs objectivity or there is potential for exploitation or harm to the client (Werth et al., 2010). Concerns regarding the ethics of multiple relationships have led to various decision-making models being proposed to aid rural practitioners. Gottlieb (1993) used three dimensions to assess the potential for harm: (a) power differential, (b) duration of treatment, and (c) termination. In addition to these dimensions, Ebert’s 1997 model emphasises the importance of conflicts of interest and the potential for harm, and subsequently provides a series of questions to aid psychologists at each step of the decision-making process. I would certainly say that rural psychologists need to be attentive to their relationships within the community. Being open and honest with clients about the issue of multiple relationships, alongside defining roles and boundaries, will ultimately be helpful in minimising role confusion (Helbok, 2003). Any individual who seeks assessment and/or treatment by a psychologist should be afforded the opportunity to control who can be party to this knowledge, especially if accessing services from an area where doing so carries a heavy stigma. Living and practising within a rural community brings to the forefront the importance of ensuring confidentiality. This includes not only issues on the part of the psychologist, but also other members of staff who may know the individual, and importantly how any confidential information would be shared across local agencies (e.g. social work, police). Having previously worked in a mental health charity in my local community I do not find it hard to imagine the burden that a psychologist may face in maintaining confidentiality, especially as I often couldn’t survive a trip to the Co-op without being asked about current service users. Being personally attached to the community will undoubtedly bring internal conflict when faced with difficult situations where duty-bound to break patient confidentiality. Where urban practice affords more opportunity for disconnect from witnessing the direct impact of breaking confidentiality, the rural psychologist may see how this has impacted upon families, their friends and their community. The Western Isles has a very distinct and diverse population with a wide spectrum of mental health problems. This would likely lead to the need for a psychologist to be a generalist working across the lifespan. A psychologist must carefully balance the need of the client where no other resources for onward referral are available, against the view that in some circumstances no treatment may be less harmful than the wrong treatment. Certainly the nature of rural practice may disadvantage a psychologist in respect of limited opportunities for consultation and reflection with peers, ongoing feedback regarding their practice and continuing professional development. However, close relationships with professional peers (e.g. consultant psychiatrists, community psychiatric nurses), a strong personal support network, a good work–life balance and a balanced caseload would ultimately go some way in addressing concerns regarding competence. When walking down the main street in Stornoway it would on average take less than 60 seconds for me to be recognised. Although this in itself may not directly lead to ethical dilemmas, some researchers have suggested that the visibility of psychologists in rural communities precludes the option of psychodynamic therapy with clients (Sterling, 1992) for various reasons; for example, identification with the therapist can be used by clients as a resistance to dealing with certain material (e.g. painful or embarrassing material). In addition, being visible to clients in the community brings the dilemma of whether the psychologist should self-disclose personal information. Views on this are mixed, with some suggesting that it can alter the nature of the therapeutic relation and lead to negative transference (Helbok, 2003). Others state that self-disclosure can help the client engage in positive interpersonal interactions and can increase trust and affiliation (Bernstein, 2000). Although many psychologists may use self-disclosure as a therapeutic technique (Tillman, 1998; see also Ruddle and Dilks in the June issue, http://thepsychologist.bps.org.uk/volume-28/june-2015/opening-disclosure) the decision to do so should be clinically driven and client-focused. Rural psychologists may also feel a need to be accepted within their local community. Therefore, they might be mindful of their actions in public, acknowledge that they may be judged on these actions and understand the importance of modelling authenticity and trustworthiness. I feel that being such a visible figure in the local community will also allow the psychologist to be viewed as simply another human, which may be inspirational for clients to know that the psychologist has faced problems and made mistakes from which they can potentially gain hope and confidence in their own lives. Without doubt being a psychologist practising in rural areas comes with varying demands (Hastings & Cohn, 2013), not least an increased awareness of the numerous ethical dilemmas that rural practice can bring to the fore. However, as a profession our practice is governed by guidelines on maintaining good ethical practice through our professional and regulatory bodies, and research has provided some key recommendations in addressing ethical issues in rural practice including decision-making tools (Ebert, 1997; Gottlieb, 1993; Kitchner, 1988). Despite the pressures of working in a rural community, research has shown that 80 per cent of rural practitioners have high job satisfaction (Sullivan et al., 1993), and there is no evidence to date that rural psychologists experience higher rates of burnout than their urban counterparts (Helbok, 2003). There is also an opportunity to be a real generalist, tackling a broad spectrum of conditions across the lifespan. You will experience autonomy, diversity and creativity and provide an important service to a community you value and which values you. Perhaps one day I’ll be lucky enough to contribute to psychological services back home in the Western Isles. The jury is still out on whether I should ditch ‘Come On Eileen’. Bernstein, A.C. (2000). Straight therapists working with lesbians and gays in family therapy. Journal of Marriage and Family Therapy, 26, 443–454. Borys, D.S. & Pope, K.S. (1989). Dual relationships between therapist and client. Professional Psychology: Research and Practice, 20, 283–293. Cook, A.D., Copans, S.A. & Schetky, D.H. (1998). Psychiatric treatment of children and adolescents in rural communities. Child and Adolescent Psychiatric Clinics of North America, 7, 673–690. Ebert, B.W. (1997). Dual-relationship prohibitions. Applied & Preventive Psychology, 6, 137–156. Gottlieb, M.C. (1993). Avoiding exploitative dual relationships: A decision-making model. Psychotherapy, 30, 41–48. Harowski, K., Turner, A.L., LeVine, E. et al. (2006). From our community to yours: Rural best perspectives on psychology practice, training, and advocacy. Professional Psychology: Research and Practice, 37(2), 158–164. Hastings, S.L. & Cohn, T.J. (2013). Challenges and opportunities associated with rural mental health practice. Journal of Rural Mental Health, 37(1), 37–49. Helbok, C.M. (2003). The practice of psychology in rural communities. Ethics and Behaviour, 13(4), 367–384. Kitchner, K.S. (1988). Dual role relationships: What makes them so problematic? Journal of Counselling and Development, 67, 217–221. Levin, K.A. (2014). Urban–rural differences in adolescent mental health and wellbeing in Scotland. Journal of Epidemiology and Community Health, 68. A68–A69. Nicholson, L.A. (2008). Rural mental health. Advances in Psychiatric Treatment, 14(4), 302–311. Sterling, D.L. (1992). Practicing rural psychotherapy. Psychotherapy in Private Practice, 10, 105–127. Stockman, A.F. (1990). Dual relationships in rural mental practice: An ethical dilemma. Journal of Rural Community Psychology, 11, 31–45. Sullivan, W.P., Hasler, M.D. & Otis, A.G. (1993). Rural mental health practice: Voices from the field. Families in Society, 74, 493–502. Tillman, J.G. (1998). Psychodynamic psychotherapy, religious beliefs, and self-disclosure. Journal of Psychotherapy, 52, 273–286. Werth, J.L., Hastings, S.L. & Riding-Malon, R. (2010). Ethical challenges of practicing in rural areas. Journal of Clinical Psychology: In Session, 66(5), 537–548.